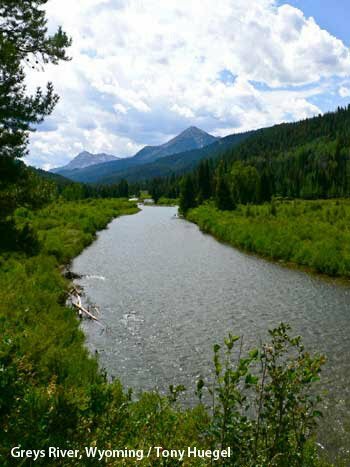 The Greys River Ranger District of Bridger-Teton National Forest (307-886-5300) has closed the southerly segment of Greys River Road until Oct. 1, 2010. The reason is to replace three bridges. 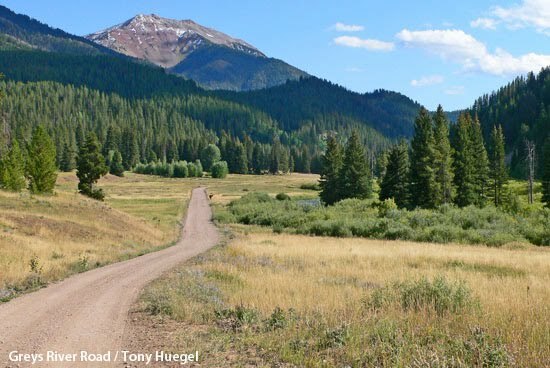 But you can still make the north-south ride or drive by detouring over Thompson Pass (road 10128) and McDougal Gap (road 10125), which are linked by scenic road 10046 over Bare Pass. 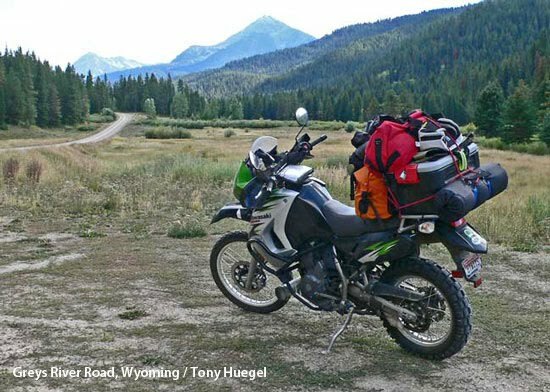 I learned about the closure recently when I rode my KLR 650 from Idaho Falls, Idaho, to Smiths Fork Road southeast of Afton, Wyoming. With Labor Day weekend approaching, I thought I'd pass along that information -- and more. When I turned east off U.S. 89 south of Afton onto Smiths Fork Road (10072), I was greeted by a large sign announcing "Road Closed." Darn! I thought to myself. But when I read the sign, I learned that the closure was at three locations on the southerly section of beautiful Greys River Road (10138) (Google Map). The locations, from north to south, are Shot Hole Bridge, Poison Meadow Bridge and East Fork Bridge. All are north of the junction with La Barge Creek Road. No matter. I'd been along Greys River Road before. I was planning to check out two different roads. My plan was this: ride La Barge Creek Road -- a gorgeous unpaved backway -- to road (10103; county road 306) south along Fontenelle Creek. 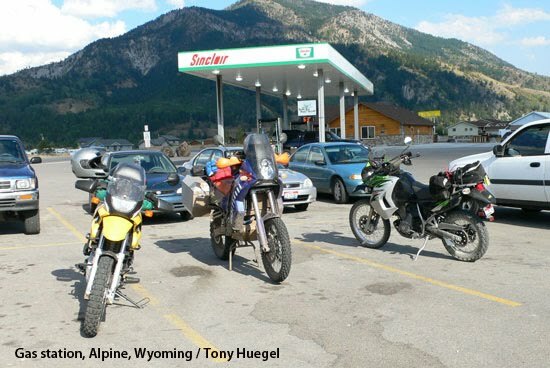 Then that south to Kemmerer, Wyoming. 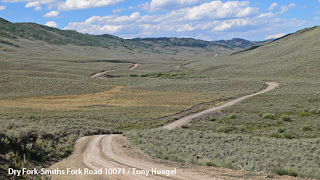 From Kemmerer, I would take the Big Spring Scenic Backway/Hams Fork Road (10062/305/10162) over a ridge and down past Big Spring to the junction with Dry Fork/Smiths Fork Road (10071). 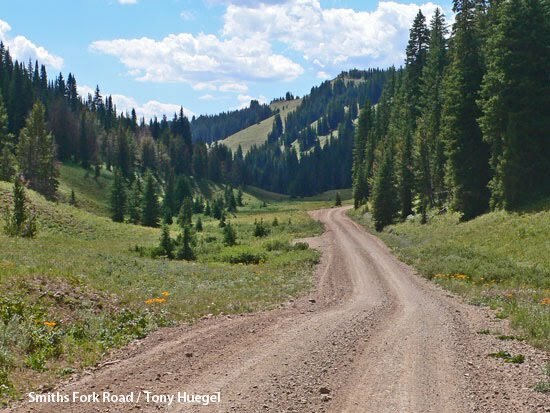 So I headed along Smiths Fork Road, and found conditions just about ideal for dual-sport motorcyling. I had anticipated mud from recent rains, but instead found just enough roadbed moisture to keep dust down. From the junction of Greys River Road and La Barge Creek Road, I took the latter southeast toward its namesake town. All the while I kept an eye out for the road south to Kemmerer, No. 10103. I passed a road with another "Road Closed" sign, but no road-number sign. So I continued on through the hamlet of Viola. Not far beyond that I turned back to search again. I didn't understand how I had missed the turn. When I reached the road signed as closed, I concluded that that had to be it. And it was. 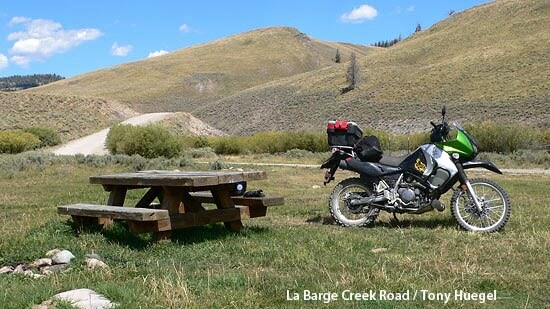 It crossed La Barge Creek on a bridge a short distance ahead, then climbed into the mountains. Alluring indeed. But the sign warned that road was closed at a private-property boundary at Minnie Holden Creek a few miles ahead, and that there was no turnaround space. Disappointed, I returned to Smiths Fork Road, and backtracked. This time, though, I turned south on Dry Fork/Smiths Fork Road (10071). It turned out to be a more primitive native-surface single-lane road that no doubt would be treacherous when wet. This day, though, it was dry, and the riding couldn't have been better. It was beautiful, and I had it to myself. I followed it the junction with 10162, which winds up a canyon of sorts toward a ridge, the scenic Big Spring picnic area, and Hams Fork campground. It was late in the day, however, so I turned back after only a couple of miles, and continued on State Route 232 to Cokeville. From there, it was a beautiful highway ride north to Alpine, the northern terminus of Greys River Road. I grabbed a bite at one of my favorite eateries, the Cheeseburger Factory. Then road the highway back to Idaho Falls, arriving home at about 9:30 p.m. and well after dark.